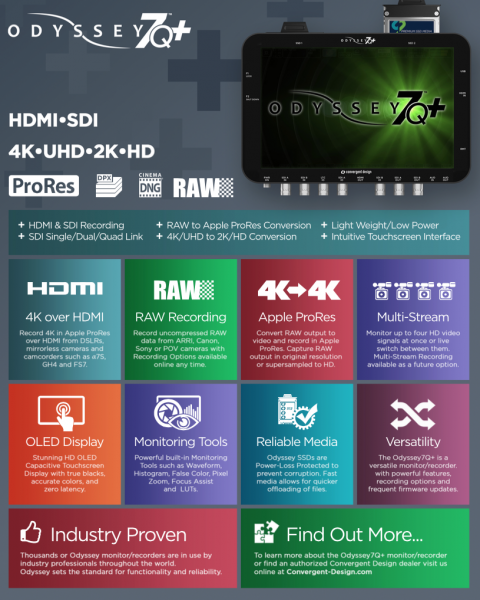 Convergent Design has today announced their new flagship monitor/recorder – the Odyssey7Q+. The big change to the older 7Q is that the new model has the ability to accept 4K/UHD video via HDMI and record it in Apple ProRes 422 (HQ). 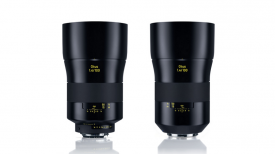 This is what many owners of Sony’s a7S and Panasonic’s GH4 have been requesting. It will supercede the Odyssey7Q, which is no longer being manufactured, and retail for $2295US. 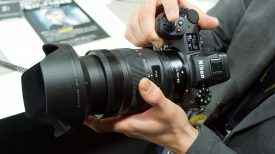 Convergent Design will still fully support the existing 7Q and more firmware updates are planned, but there will be no way to upgrade the 7Q to 7Q+ spec. The 7Q+ features a HDMI 1.4b input and this will allow it to also accept 1080p60. The HDMI is limited to 8-bit 4:2:2, up to 1080p60, 30fps in UHD (3840×2160) and up to 24fps in 4K (4096×2160). 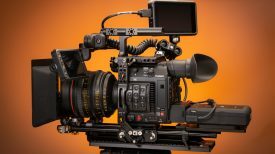 This is good news for owners of cameras such as the Panasonic GH4, Sony a7S and Sony FS7 as well as any other camera capable of 4K/UHD output via HDMI. The 7Q+ retains all the existing functionality of the original 7Q. It has the exact same OLED 1280×800 screen with RGB waveform, RGB Histogram, False Color, Pixel Zoom and monitoring LUTs. The size, design and proprietary SSD drives remain the same and so all additional third party accessories that worked with the 7 and 7Q will work with the 7Q+. Convergent Design will begin accepting orders for the Odyssey7Q+ from today. 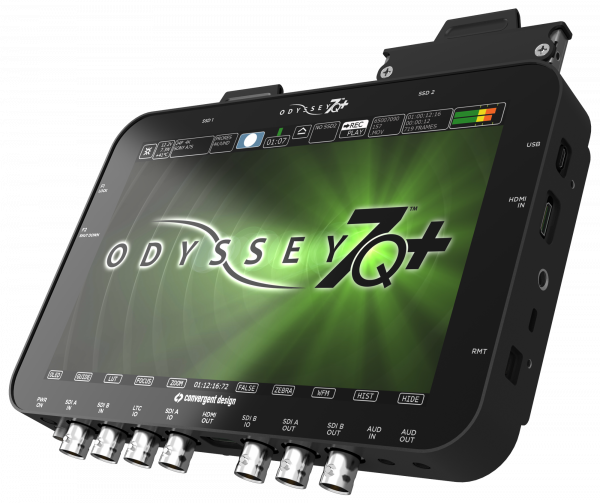 Convergent Design expect to begin shipping the Odyssey7Q+ on or around December 19, 2014. The surprise announcement from Convergent Design means that we will have two new 4K HDMI recorders on the market within a few weeks. The slightly delayed Atomos Shogun is supposed to ship at around the same time. This extra choice is great news for potential buyers who need to record 4K/UHD via HDMI. Why a new recorder? At the time the Odyssey7Q was designed and developed the chip Convergent Design used was the most advanced available and cameras like the a7S and GH4 didn’t exist. Sadly the HDMI receiver chip on the original Odyssey7Q is not technically capable of anything greater than 1080p30/1080i60. The new Odyssey7Q+ has a newer, more advanced HDMI receiver chip which allows 4K @24P and UHD @30P into the Odyssey7Q+ over HDMI. Unfortunately this was not just a simple exchange of parts. Convergent Design had to redesign the recorder’s hardware and firmware, as well as some other fairly intricate work within the unit. On the outside the only real difference anyone will notice is that the locations of the HDMI input and output have been swapped and a new label added. Convergent Design has no more 7Q units in stock. If you have just ordered a 7Q and it hasn’t shipped yet, you will be offered a 7Q+ at no additional cost. Please check with your local distributor or dealer for more details. If you have just bought a 7Q and were hoping for a firmware update to allow you to record 4K/UHD to your 7Q then this announcement may leave you feeling frustrated. Convergent Design isn’t offering any trade in deals on the 7Q. If you are an existing owner of an Odyssey7Q wishing to purchase an Odyssey7Q+ you can however participate in the Odyssey7Q Owner Loyalty Program. With the purchase on an Odyssey7Q+, Odyssey7Q owners will get a one year warranty extension on their Odyssey7Q, any purchased Record Options replicated on their Odyssey7Q+, and a $500 credit to their account on the Convergent Design website. More details on the Owner Loyalty Program are available from the Convergent Design website. The Odyssey7Q cannot be retrofitted or otherwise upgraded to become an Odyssey7Q+. I think a lot of existing 7Q customers would have preferred to have been able to send their 7Q in for a hardware upgrade to get 4K/UHD, even if they had to pay for it. Having to buy a whole new monitor/recorder will certainly annoy some, even if they can sell their old 7Q for a healthy amount. That said many existing 7Q customers may have no need for recording 4K/UHD over HDMI, but even so having that added flexibility would have been nice. Convergent Design is also releasing a new 1TB Odyssey SSD [CD-SSD-1TB, US list $1395]. This Odyssey SSD is compatible with the Odyssey7, Odyssey7Q and Odyssey7Q+ with the installation of the latest Odyssey firmware update, scheduled for release with the Odyssey7Q+. Please note that the 1TB SSD features a lower dollar/gig ratio than the smaller capacity SSDs ($1.36/G v. $1.55/G). The 1TB Odyssey SSD is available for immediate shipping. As a 7Q owner I have been very impressed with the ease of use and continual improvement of the product. I would have liked to have seen my existing 7Q being able to record 4K/UHD over HDMI but I do realise it is a hardware limitation and not something that can be fixed via firmware. For people looking for an external recorder/monitor the 7Q+ certainly ticks a lot of boxes and may well be the most versatile unit currently on the market.